What is the meaning of "Free Speech" if people don't listen to each other? We hear from all sides and every quarter that there is a need for constructive dialogue on so many critical issues; for people who disagree to start listening to each other. We strongly agree, and we have been passionately pursuing creating space for such dialogues both face-to-face and online. We also see that many are afraid to engage in dialogue on emotionally charged topics because of where things might lead. This is as true at public protests as it is in homes and community meetings. How do we think about and discuss these kinds of issues constructively? How might we do this without dehumanizing each other and scapegoating? How might we begin to hear each other and empathize even if we don't agree? Members of the political left and right in facilitated constructive dialogue. The Empathy Tent is a project of the Center for Building a Culture of Empathy founded by Edwin Rutsch in 2002. Edwin created the Empathy Tent as a portable pop-up space where we provide listening to anyone who wants it, and where we invite people to listen to each other regardless of point of view. We use a simple structured dialogue process based in active listening and skillful facilitation. 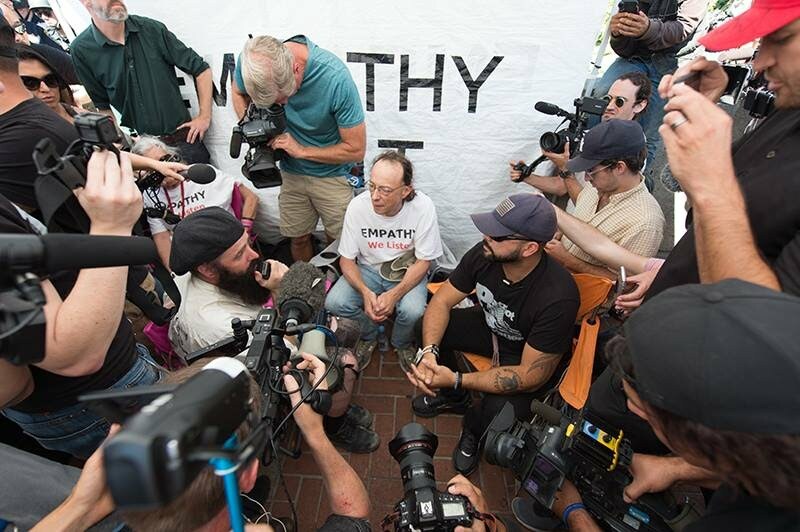 Since the 2016 presidential election we have brought our Empathy Tent to the front line at rallies in Berkeley and throughout California that feature left/right conflict to create a space for empathy and constructive dialogue. We've facilitated dialogues between opposing rally organizers in San Francisco, between the leader of an impeach Trump rally in L.A and counter protesters, and with white supremacists. Our purpose is to help people understand one another and to begin to see each other as individuals, as people, rather than as stereotypes or ideological representatives. 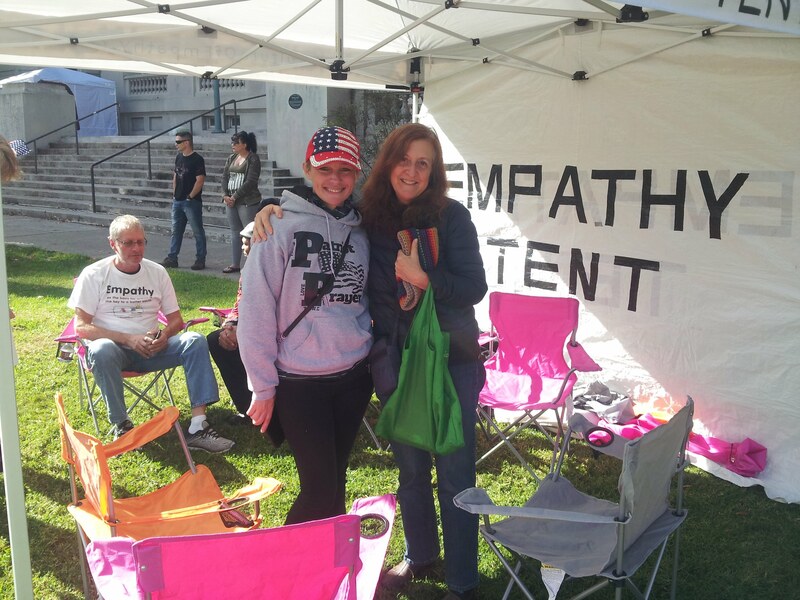 Empathy tent personnel helping facilitate peaceful discussion. The Empathy Tent is an emotionally and intellectually risky space where participants can say whatever they want. Our process is different than normal conversation because turn taking is structured and the speaker's feelings and thoughts are reflected back to them until they feel fully heard. The speaker then becomes the listener. Participating equally in mutual listening and speaking results in a feeling that people are working to understand each other rather than competing to defeat each other. It also slows dialogue down so that everyone has a chance to reflect on what's being said. This has a surprising effect on both the listener and the speaker, and on others present. In this way our structured process creates a strong container for difficult dialogues, and the possibility for transformation. 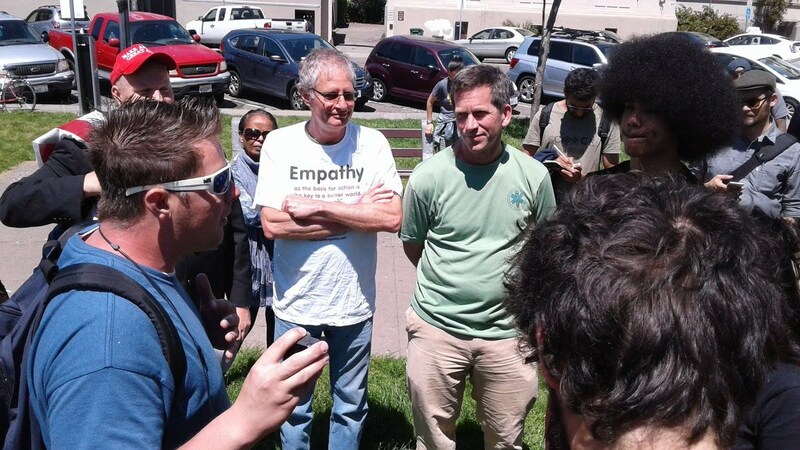 In Los Angeles we mediated between 6 pairs of participants with one person from each side. Each mediation ended with a strong connection between the participants and an agreement to continue online with video conferencing. 50-100 people ended up hanging around in proximity to our tent, many dialoguing respectfully amidst strong disagreements over immigration and other difficult subjects. To people who say that there are some not worth talking to we would say this: It is true that not all attempts at dialogue are successful, but that doesn't mean it's not worth trying. We have been consistently amazed at the false assumptions that emerge on all sides when people really start listening to each other. It's also important to understand that listening and reflecting back to a speaker does not mean that you agree in any way. Our process is about each person feeling understood and heard for what is important to them, and the shifts that potentially come from that, not about agreeing with what anyone says. As an example, a Jewish member of our team participated in dialogue with members of Identity Evropa, a white supremacist group. When one of them asked "what is Nazism anyway" the Jewish speaker responded "For me Nazism means that half my extended family was killed, that my father at age 10 and his immediate family were forced to flee Austria, and that the surviving members of my family are now spread all over the world". The Identitarian responded "but the Nazis were just trying to eliminate the communists". The facilitator then intervened and asked the listener to reflect back what the speaker is saying. An Identitarian even jumped in and told his friend "yeah, that is what you have to do". Despite what was clearly something that was difficult to voice, especially publicly, the Identitarian was finally able to say "so for you, Nazism means that half your family was killed, your father at age 10 became a refugee ..." This is a clear example of why to engage in structured dialogue regardless of where you stand. You will be heard to your satisfaction. We acknowledge that listening and understanding each other is not all that is needed to resolve conflict. It is an important first step. We want to provide support for people to engage in this first step so that understanding and trust has the possibility to grow, and so that learning how to do this can be passed on to others. After all, if we refuse to listen to each other, what is the alternative? an Empathy Circle dialogue about gun control. We can be reached at EmpathyTent.com.